With the end of the year in view, small businesses and self-employed taxpayers are encouraged to remember the importance of making quarterly estimated tax payments. For help determining how much you owe in estimated taxes and whether you should be paying on a quarterly basis, or if you were recently notified by the IRS that you underpaid for last year’s taxes or failed to file a return at all, you should strongly consider consulting with an unfiled taxes attorney as soon as possible who can help you avoid the resulting fines and penalties. Those who participate in sharing economy activities, but are not hired as employees. They didn’t have any tax debt last year. For this year’s taxes, anyone who pays less than 90 percent of the tax total shown on their return or 100 percent of the total on last year’s return by withholding taxes from their paycheck or making estimated payments during the year could face serious tax penalties. It’s important to note that most penalties are assessed not because a person fails to pay taxes at all, but because he or she mistakenly underpaid for a specific year. 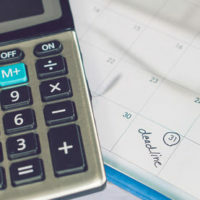 The deadlines for those who owe estimated taxes for the 2018 tax year are April 18th, June 15th, September 17th, and January 15th of next year, although some taxpayers may be eligible for extensions if they live in a presidentially-declared disaster area. The Treasury Department’s Electronic Federal Tax Payment System (EFTPS). However, it is also possible to pay by check, debit or credit card, money order, cash, or same-day wire. Those who are unable to meet their tax obligations could be eligible for a monthly installment plan if they apply for a payment plan or qualify for an offer in compromise, which allows taxpayers to settle tax liability for less than they actually owe. Finally, in some cases, the IRS is willing to temporarily delay collection of estimated payments until a person’s financial situation improves. To speak with an experienced Florida unfiled taxes attorney who can explain your obligations when it comes to paying estimated taxes or back taxes, please call 386-490-9949 and we’ll help you set up a free initial consultation with dedicated Florida lawyer Ronald Cutler, P.A. A member of our legal team is standing by to address your questions and concerns.